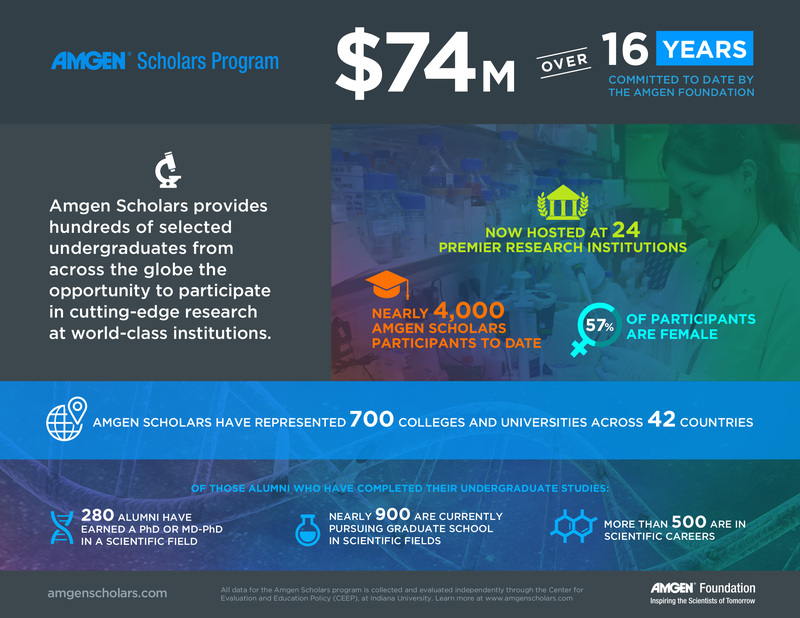 THOUSAND OAKS, Calif., Nov. 1, 2018 /PRNewswire/ -- The Amgen Foundation today announced the expansion of the Amgen Scholars Program, a hands-on research program that allows undergraduates to spend a summer at one of many of the world's premier research institutions. The new four-year, $21 million commitment brings the program to a total of 24 elite institutions across the U.S., Europe, Asia and, for the first time, Australia and Canada. 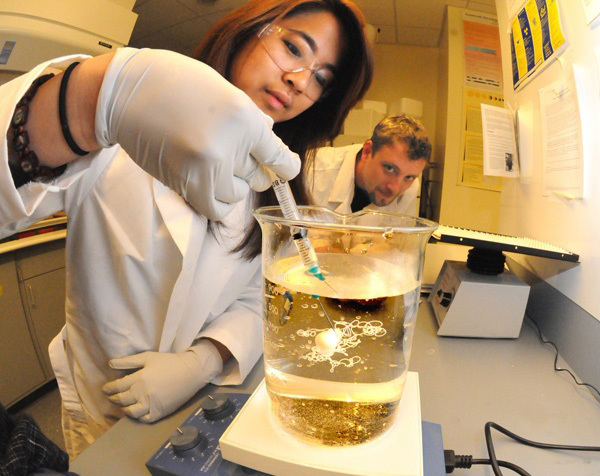 Over the next four years an additional 1,500 undergraduates from hundreds of colleges and universities will have the chance to engage in research opportunities in biomedical and biotechnology fields. This brings the Amgen Foundation's total investment in the Amgen Scholars Program to $74 million over 16 years, reaching 5,400 undergraduates. This signature initiative builds upon the Amgen Foundation's mission to advance excellence in science education and empower tomorrow's innovators, a goal to which the Foundation has contributed nearly $150 million globally to date. Eight new Amgen Scholars partners—Duke University, Johns Hopkins University, National University of Singapore, Tsinghua University, University of Melbourne, University of Toronto, University of Texas Southwestern Medical Center and Yale University—will join the already distinguished group of host institutions, which includes Harvard University, National Institutes of Health, University of Cambridge and the University of Tokyo, among others. "As the pace of innovation increases, so too does the need to educate the scientists of tomorrow," said Robert A. Bradway, chairman and chief executive officer at Amgen. "We look forward to further expanding the reach of the Amgen Scholars Program, which has already provided research opportunities to thousands of talented undergraduates at premier institutions around the globe, and now has the potential to do much more." "The Amgen Scholars Program solidified my passion for translational research and made me confident in a laboratory environment. In addition to gaining skills in several experimental techniques, I also learned how to think like a scientist," said Joy Wolfram, Ph.D., Amgen Scholar Program alum, and Mayo Clinic lead for the Nanomedicine and Extracellular Vesicles Lab. "After completing the program, I have been extensively involved in international research collaborations between the United States, China and Europe." Amgen Scholars aims to break down barriers for many students who otherwise would not have the opportunity to engage in science at the world's top educational and research institutions. Financial support for students is a critical component of the program, which seeks to ensure that eligible students, regardless of their financial status, can participate. "The Amgen Scholars Program offers our students a unique opportunity to conduct groundbreaking research under the mentorship of world-renowned scientists," said Rakesh Khurana, Danoff Dean of Harvard College. "The academic and professional success of so many of the program's alumni over the past 12 years clearly demonstrates the value of the program, and why this expansion is so exciting."